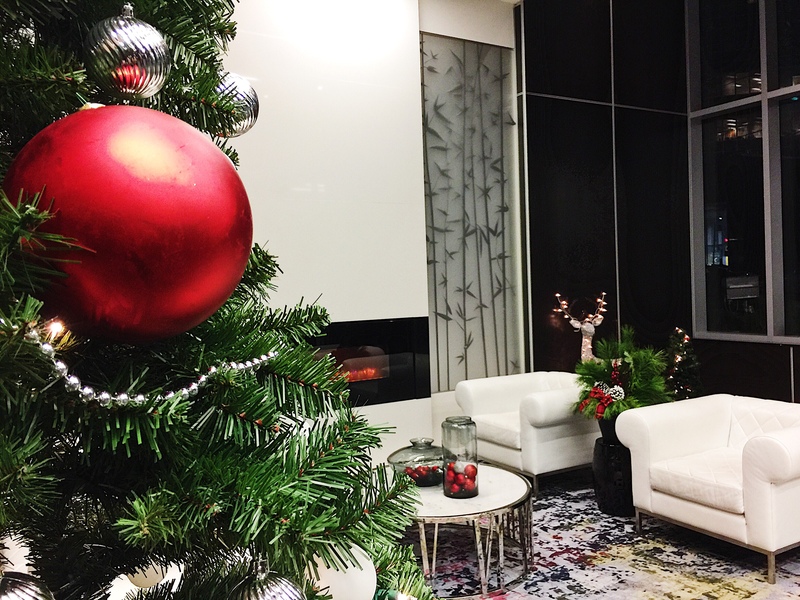 Holiday decorating is on high-gear and I’m enjoying the festivities more than ever now with a décor project to keep my December busier than ever. 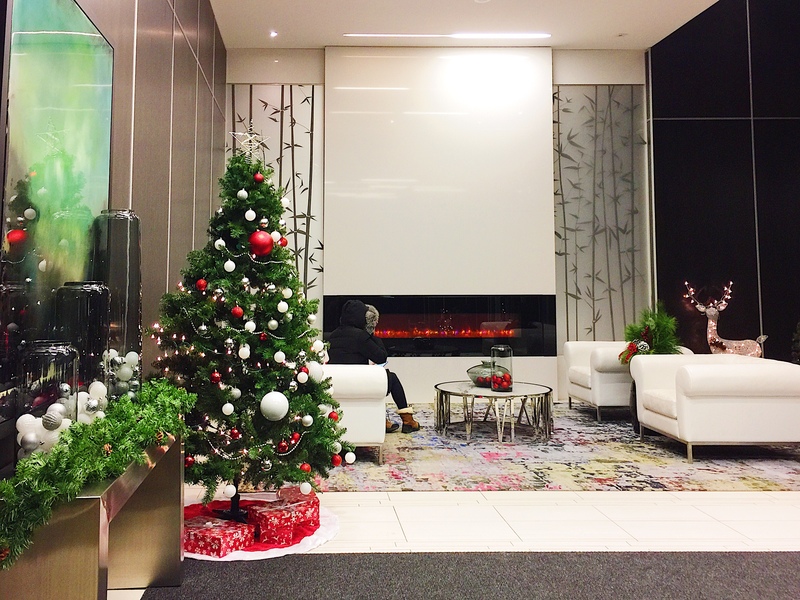 Last weekend I had the pleasure of working with the Board of Directors and property management of First Services Residential to decorate the lobby area of two Yonge-Street condominiums by designing, planning, and setting-up $1,000 worth of Christmas decorations to create a festive, warm and welcoming area used regularly by more than 800 residents. 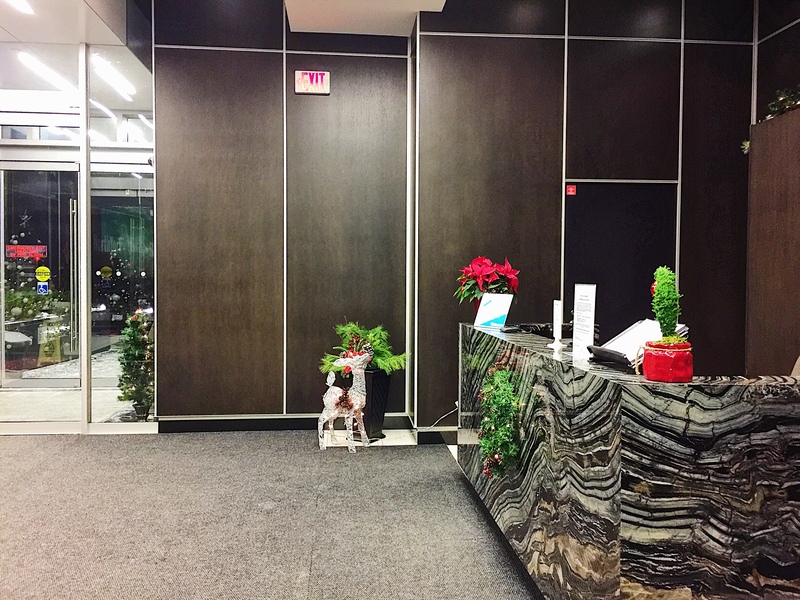 My vision of the lobby area was to keep it modern and sophisticated by including classic Christmas decorations that had modern twists to them, usually through including natural elements like pine cones, birch logs, and faux garlands with a few over sized ornaments. Since the space is pretty monochromatic, I planned to introduce mostly some red accents with white and silver complements. These gorgeous sprawling garlands can be used along fireplace ledges as well. 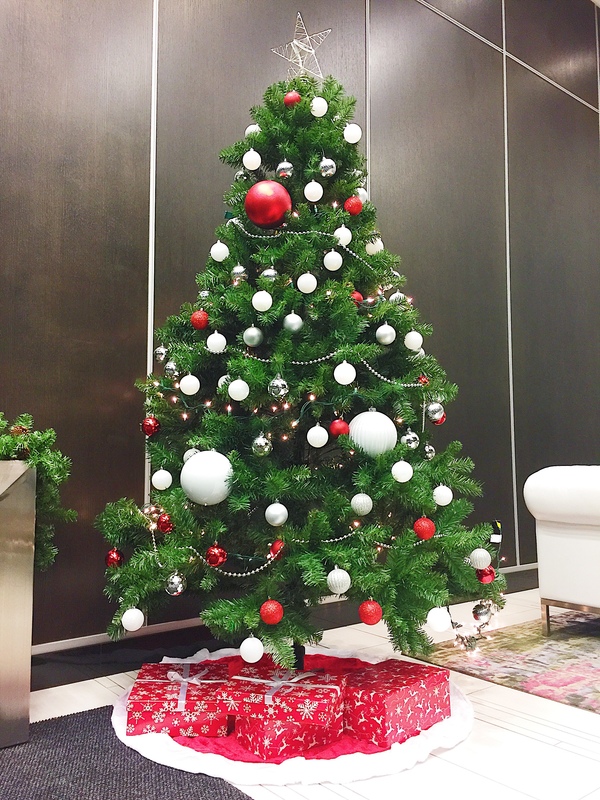 Thankfully the building already had its own Christmas Trees which were 7.5 feet tall and expanded to about 56′ in diameter. These were the Celebrate IT Unlit Alberta Spruce. 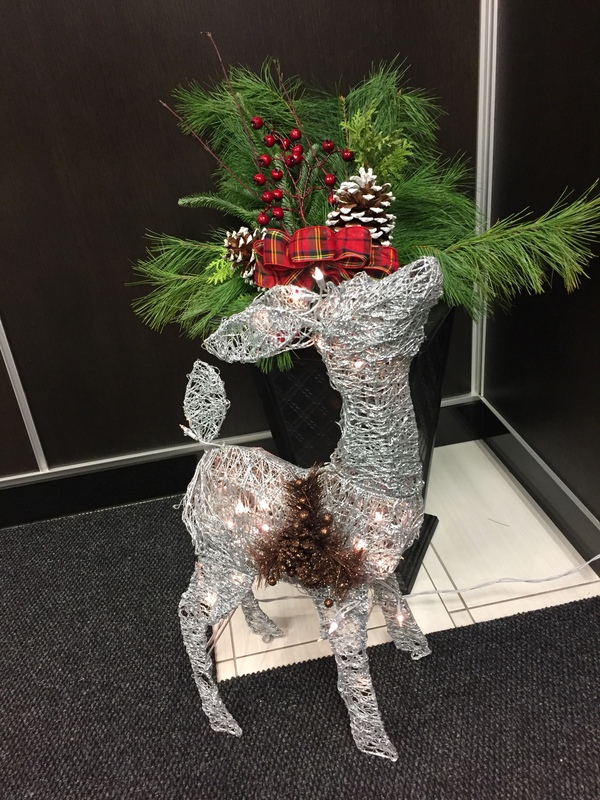 We also were lucky enough to find some pretty reasonably priced fresh-cut outdoor holiday plants. You wouldn’t believe how much some of these cost (some were upwards of $200 each)!! 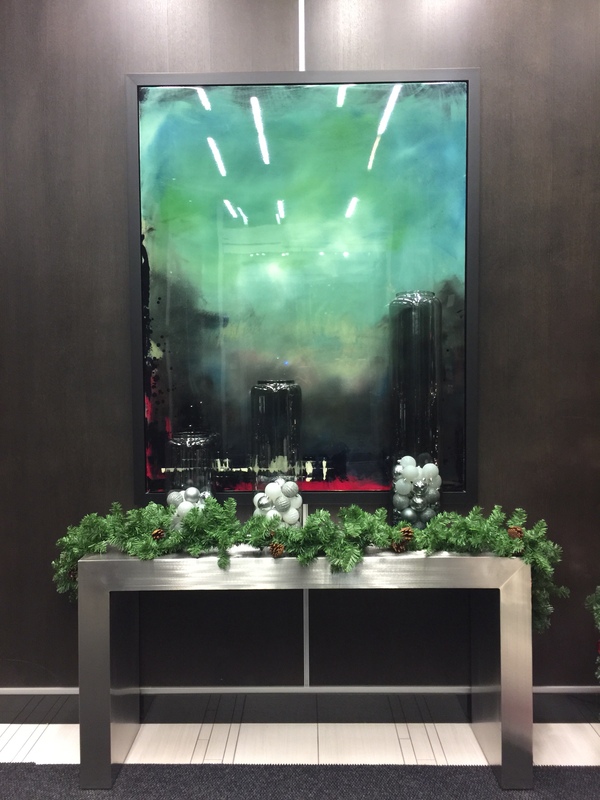 We went for a simple and elegant holiday theme with strong greenery and muted festive reds and elements of nature. I love the mix of these over sized pine cones with the plaid ribbon and red holiday berries. 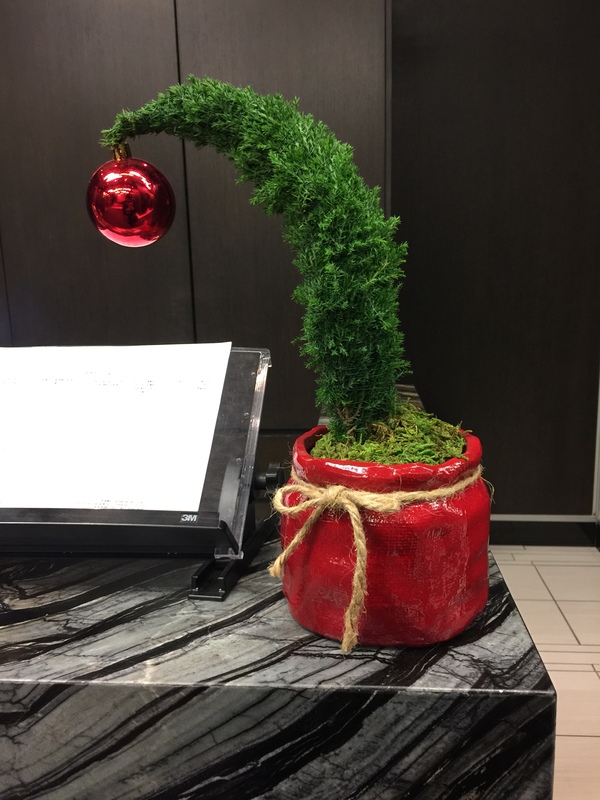 In addition to the front desk, we also decorate the seating area with some additional ornaments. It was a perfect place to relax and wait for friends and family over the holidays. What a blessing it is to have wonderful family and friends to enjoy such a festive space with and to have a place to live in which we can call home. Thank you once again to First Services for giving me the opportunity to decorate such a lovely space.